First, it conquered India. Now, it wants to win over Europe. 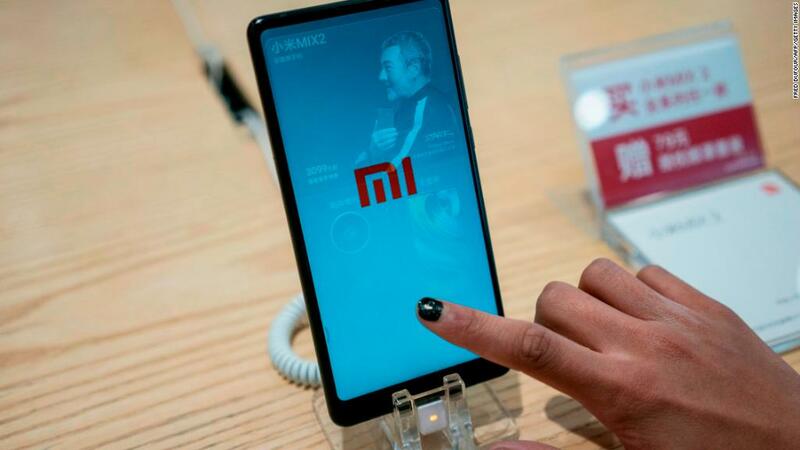 Chinese smartphone maker Xiaomi is making an aggressive play for European markets like France, Italy and Spain. The expansion comes ahead of the company's highly anticipated IPO, which is expected to raise billions of dollars this summer. Xiaomi is best known for selling cheap, high performance smartphones. The bulk of its sales — more than 70% — are in China. But it has made inroads in other Asian countries, recently overtaking global leader Samsung to become the top smartphone seller in India. Now, the Chinese company is looking to repeat that success in the more mature markets of Europe, and it's off to a strong start. Xiaomi is currently the fourth largest smartphone company in Europe, behind Samsung (SSNLF), Apple (AAPL) and Chinese rival Huawei, according to research firms IDC and Canalys. It's competing strongly in Spain, Greece and Russia. Francisco Jeronimo, a London-based analyst with IDC, said the buzz surrounding Xiaomi in Europe reminds him of the early success of the iPhone. "I haven't seen any other vendor able to attract and push demand from consumers directly like Xiaomi is doing now and Apple did in the past," he said. Xiaomi is riding the momentum, launching in France and Italy with splashy new stores in Paris and Milan late last month. Although the company has achieved rapid growth, it's not nipping at the heels of the top players yet. According to Canalys, Xiaomi sold 2.4 million phones in Europe last quarter, far fewer than Samsung's 15.2 million, Apple's 10.2 million and Huawei's 7.4 million. "It doesn't seem like a huge amount at the moment, but the rate they're expanding is impressive, considering it's been less than a year" since Xiaomi entered the European market, said Ben Stanton, a Canalys analyst based in the United Kingdom. Can it win over carriers? Maintaining that growth rate, especially in countries like France and the United Kingdom, will depend a great deal on Xiaomi's relationships with wireless carriers. As many as 50% of consumers in western European buy their smartphones through carriers, according to IDC. Forging ties with European carriers is more complicated than Xiaomi's preferred strategy of selling phones directly through online sales, retailers or its own stores. For one thing, Xiaomi wants to keep prices low, announcing last year that it would cap smartphone profit margins at 5%. So the margins Xiaomi is offering carriers "are not very good," making them wary of partnering with the company, according to Jeronimo. Xiaomi will also have to make alterations to its phones, which will increase production costs. "If it wants to work with carriers, it has to learn to do things like SIM-locking phones, which has to be done in factory," Stanton said. Xiaomi appears willing to adapt to the different markets, partnering with CK Hutchison's (CKHUY) mobile carrier network Three last month. Under the deal, Xiaomi phones will be sold in Three's stores in the United Kingdom, Ireland, Austria, Italy, Denmark and Sweden. 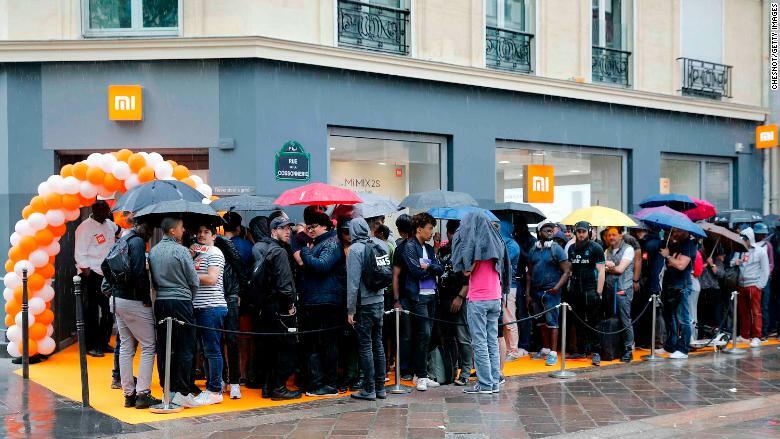 Customers lined up in front of a new Xiaomi store in Paris last month. Xiaomi has so far succeeded in Europe by wrestling market share away from other low- and mid-range smartphone makers; the vast majority of phones it sells in Europe cost less than €200 ($235). "What consumers want is a device that looks like an iPhone, performs like an iPhone, but is half the price of an iPhone ... and Xiaomi has been able to nail it," Jeronimo said. In the next year, analysts predict Xiaomi will focus on expanding into as many European markets as possible, and eventually start pushing pricier smartphones. Xiaomi is also interested in the United States — CEO Lei Jun has previously said he wants Xiaomi to make its US debut by early next year. But that could be a tougher challenge than Europe. Major Chinese smartphone makers Huawei and ZTE (ZTCOF) have faced significant challenges in the United States, including accusations from government agencies that their devices could pose security risks because of ties to the Chinese government. Huawei and ZTE dispute the claims. Xiaomi hopes to avoid that fate, and could use success in Europe to help shape its strategy for the United States. "Europe is the stepping stone," Stanton said.